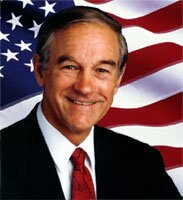 Texas Congressman and GOP presidential candidate Ron Paul gets his own page on this site because he is everything any small businessman could want in a US president. He is making tremendous strides for a so-called "dark horse" candidate, raised millions in each of the last two quarters, and unlike the other GOP contenders, actually has something new to say. What is unique about him is not that he says exactly what millions of Americans want to hear. All politicians do that. What makes him stand out from the entire crowd is that he means every word he says - and has a thirty year track record to prove it. His policies combine maximum individual freedom and privacy - and therefore prosperity with a minimum of intervention by the federal government, both domestically and internationally. As president, he will push to terminate the IRS and federal income taxes and replace them with - nothing. He sees income taxes as a tremendous ball and chain around the neck of the US small business owner. In this video Ron Paul goes to the very crux of the matter: All the Fed can do to stave off an economic downturn is to create more money by lowering interest rates - but interest rates that are too low were the very cause of the problem in the first place. Even Mr. Bernanke can't disagree with him on that point. Now, guess what happened two days later? Ron Paul is so eminently reasonable and ultimately convincing because his has the audacity to stick to the truth and tell it like it is. In doing that, he has no agenda other than doing exactly that, and he has proven it for over thirty years now. When people hear these things, they cannot help but agree - at least those who do not have an ulterior agenda themselves. It's just that most people have never quite heard things being put the way he puts them. It is well worth any small business owner's while to listen carefully, think deeply, get more information, and then make the right decision. This website is here to help as much as possible. If you have any question the FAQ page doesn't answer well, please feel free to email me. Congressman Ron Paul was interviewed by a principal of "GoldPlanet.com" (now defunct) about his views on Digital Gold Currency, among other things. You can read the entire interview here. Another reason to get active and vote for Ron Paul in the 2008 primaries. Obama's "Money-Bomb" (with a goal to raise $5 million in one single day and obvious attempt to outdo Ron Paul) well, er ... it BOMBED today. The motto of this group is to win the mother-of-all fundraising challenge to raise $5 million on Nov 16th (day after the debate) and is dubbed as "Barack's Friday". Let's make it happen. Please ... Please ... Please spread the word. Sorry. I couldn't help but to post this. Click the button above to get 12 monthly issues of the Monitor, weekly updates with short-term prognoses on gold and silver price action, plus two special bonuses (see below), all for less than 55 cents a day. Understanding the Money issue is crucial to any business man or woman. After all, what are you in business for? If you want to develop a better understanding of US and federal Reserve policymakers are up to as they manage not only the money supply, but the very type of money we all work for are up to from week to week, subscribe to the Euro vs Dollar Gold Monitor. The Monitor provides you with an in-depth understanding of the mechanisms and all of the destructive ramifications of a debt-based worldwide currency system. It also delves into the mentality of those who operate it, and offers an uncanny analysis and forecasts of the precious metals, currency, stock, and energy markets that you will be hard-pressed to find anywhere else. In addition, by reading The Monitor you will develop a similar capacity to anticipate price movements yourself. You will be able to conduct your business with greater foresight since you will have more tools for protecting its financial integrity at your disposal.